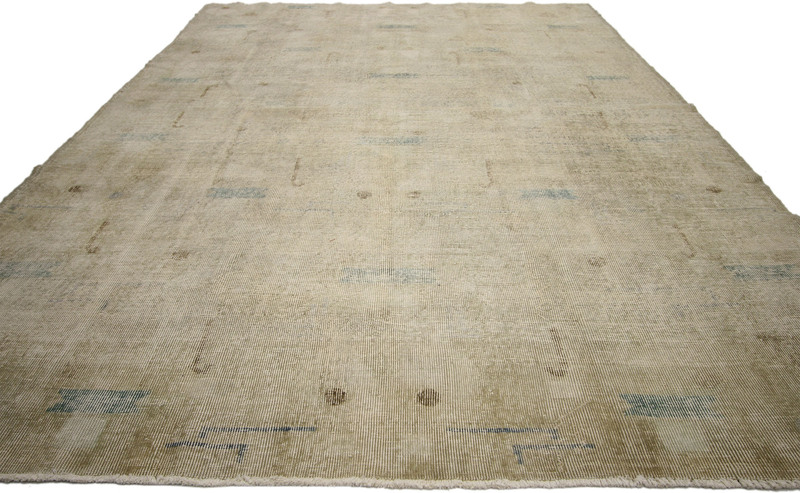 51158 Distressed Sivas Rug with Industrial Art Deco Style with Muted Colors 06’08 x 10’02 From Esmaili Rugs Collection. 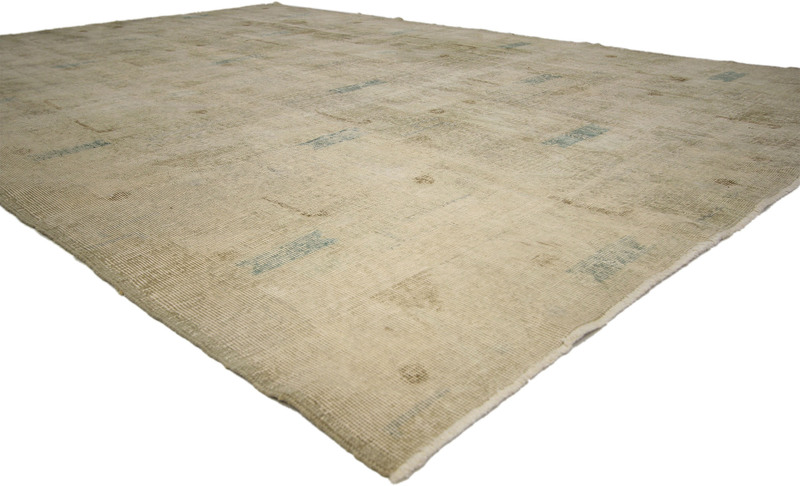 Understated elegance meets geometric dynamism in this distressed vintage Turkish Sivas rug with Industrial Art Deco Style. 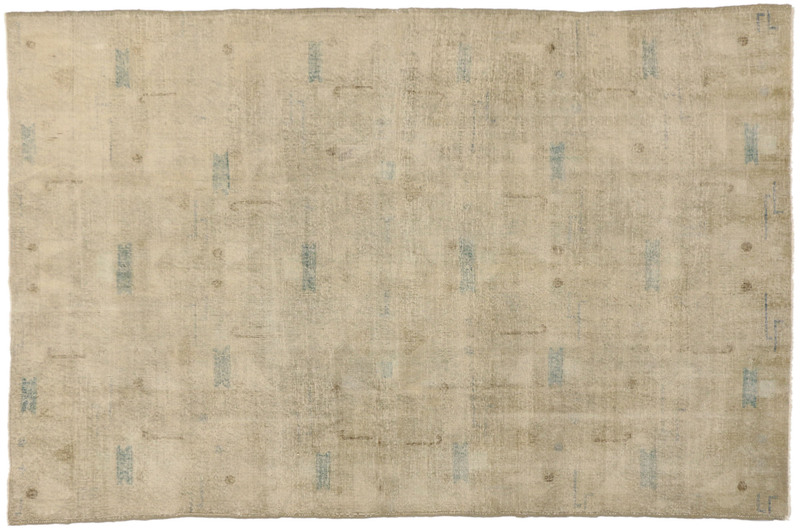 Infused with the aesthetic of famed Turkish composer and designer Zeki Muren, this distressed Sivas rug is the answer to your upscale modern interior with time-worn accents. Muted rectangles, L shapes, and circles ornament a weathered surface in an all-over pattern that runs from selvage to selvage and end to end in a borderless composition. 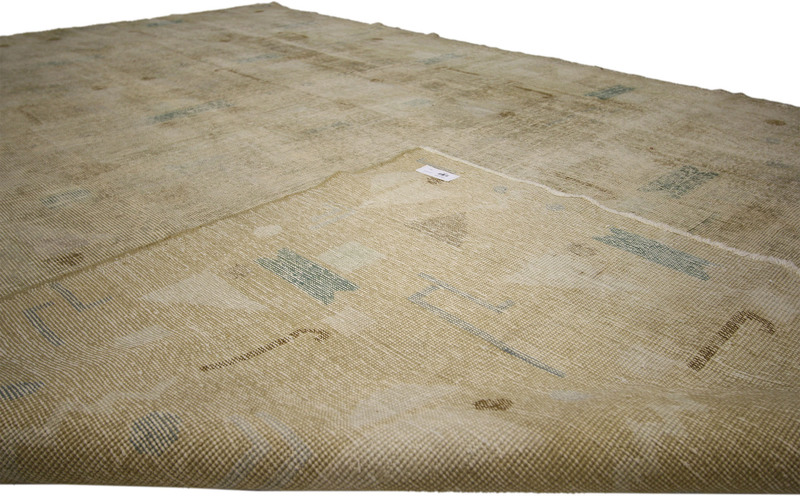 Invite the beauty of a distressed Sivas weaving into your home, office or studio space with this neutral modern rug with soft hewn textural pile and you will complete any Industrial look with panache. 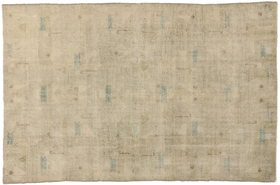 With its weathered appearance and the muted colors, this Zeki Muren inspired rug adds visual interest and texture. Perfect for bedroom, dining room, living room, front room, sitting room, parlor, mud room, den, studio, study, office, or drawing room. Well-suited for a wide range of interior styles: Traditional, Transitional, Eclectic, Modern, Mid-Century Modern, Contemporary, Industrial, Rustic, Lodge, Cabin, Art Deco, French Country, Swedish Farmhouse, Shabby Chic, Romantic, French, English Country, South Hamptons Cottage, Southern Living, Gustavian, Cubism, Abstract, Bauhaus, Postmodern, Bohemian, Boho Chic, Relaxed Coastal or Neutral Nautical. Rendered in variegated shades of beige, sand, tan, ecru, almond, champagne, khaki, and verdigris with accents of dark gray, camel, and coffee. Complementary SW Colors and Hues: Nomadic Desert, Grounded, Colonial Revival Stone, French Roast, Sundew, Underseas, Portabello, Homburg Gray, Practical Beige, Alabaster, Studio Taupe, Palm Leaf, Curio Gray, Dark Clove, Avenue Tan, Urban Jungle, Van Dyke Brown, Sand Dollar, Messenger Bag. Distressed. Age Wear and Abrash. Hand-knotted wool. Made in Turkey. Measures: 06'08 x 10'02.